At the beginning of Beethoven’s Seventh Symphony the entire orchestra begins with an enormous stroke of an A major chord. As it dissipates, a quiet, single oboe emerges, outlining a lovely melody, gently supported by strings. Conductors see such a passage in myriad ways. You ask so many questions as you imagine the music. What does the tempo indication really mean? How short is the staccato of that opening chord? When should the oboe appear from the decay of the chord? How should we shape the oboe melody? Should the oboe line LEAD to the chords with a little crescendo? This morning, in the John C. Borden Auditorium of the Manhattan School of Music, Kurt Masur was giving master classes to sixteen talented, young conductors as part of a week-long conducting seminar. As the Seventh began, Masur tried to help find meaning in the opening passage. Such is the work of a conductor – to see the notes, and then to see beyond them: A tutti chord and four notes from the oboe to one set of eyes. To a master, an existentialist phrase: The single soul, feeling deeply, against a fateful, unconcerned universe. 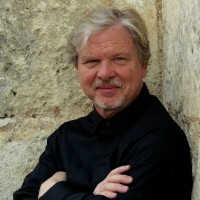 This week all of us, the participating conductors and many who are simply observing, are getting inside the heart and soul of a great composer through one of his most eminent living interpreters. But the real value of the master classes has been in the musical content. As the Seventh’s opening introduction ends, the violins in the orchestra find themselves reduced down to just one note. It’s a famous passage, but Masur offers new insights into what he thinks this passage means. 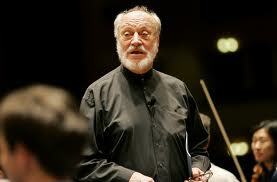 So, Masur told the young conductor to put his hands in his pockets. At the same time, the older master did the same. Then, with a nod of the maestro’s forehead the orchestra began. Masur didn’t move. He was simply present, Zen-like, in the moment. The notes poured out; the tempo settled; the tone grew organically. The music unfolded freely with so much expression that several of us fought back tears. You don’t see such a thing in this world. At one point Masur had a lengthy, public conversation with the orchestra’s concertmaster about the bowings in a particular passage in Beethoven’s Seventh. Quietly, to her section, the concertmaster made a comment outside of the maestro’s ear. The conductor began again, and the passage suddenly went splendidly. “No. We just played it better,” came the answer. There were giggles everywhere. There will be a public concert featuring Masur and nine of the conductors on Friday night, February 17th at the Manhattan School of Music. The all-Beethoven program includes Egmont Overture, and the Sixth and Seventh Symphonies. and conductors find…often by standing next to him/them….with hands in pockets, which i have watched him do, many times over the seven years…..HIS DEVOTED PRESENCE Is a gift he brings each year to the Manhattan School of Music. HIS PRESENCE, is powerful, most especially as he ages. Today, i felt he was Beethoven,–or maybe they were standing together side by side on stage…….HE IS A LIVING MASTER.. Everyone working with him this week must FEEL IT… many of us cherish being in the audience, listening to Masur and colleagues, making music.